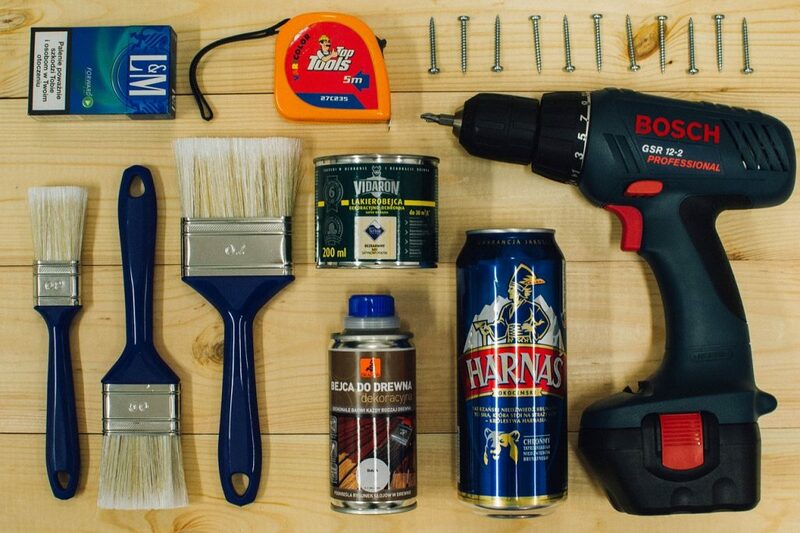 Whether you plan on selling your house in the near future – and want to set a higher asking price – or you simply need a bit of a change in your day-to-day living, there are plenty of options to consider when it comes to home improvement. Of course, every person or family has their own distinct priorities. You may need to replace a faulty oven, create more space within the house, redecorate a particular room, or even transform the garden into a liveable space. While any increase in total market value depends on how much you choose to invest in the first place, everybody can do a few things to get the ball rolling. In this guide, we will look at some of the factors which can influence property value as well as suggest a few small tweaks which can go a long way. How can location affect the value of my home? First, let’s focus on something you can’t change – where your home is based. The effect of location on property values can vary depending on a number of external factors. For example, living in an area with an excellent local economy which features a good community spirit can do wonders for property prices. In a similar fashion, if a school is due to be built near you, the value of your home could increase. One report, published in the Independent, highlighted the effects of having a supermarket on your doorstep. 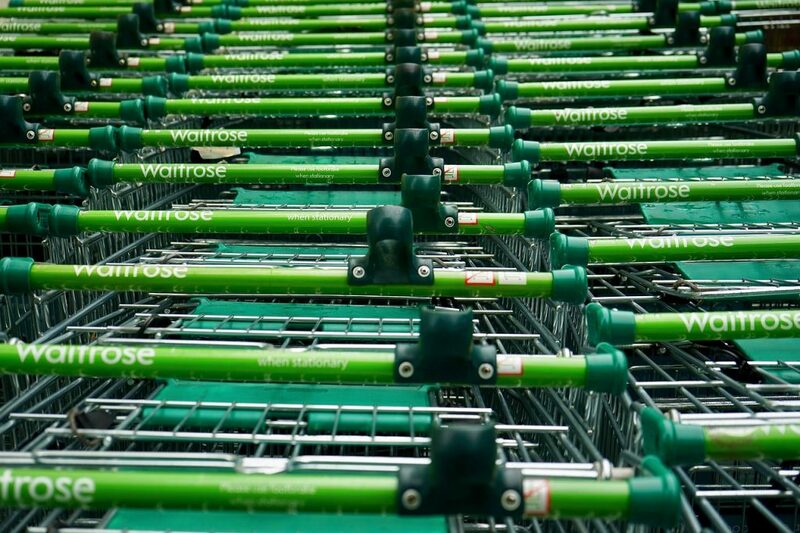 According to the report, living near a Waitrose could add more than £36,000 to the value of a home. In fact, being in close proximity to any major supermarket may improve property prices by approximately £22,000. This has lead to some individuals describing this as the ‘Waitrose effect’. In 2017, an article in the Guardian highlighted the areas of the UK where property prices were increasing. Over a 12-month period, the North West saw the greatest hikes with a seven percent gain in house values. In contrast, the value of homes in London had a regional increase of 2.5%. Therefore, although you can’t change where your property is based, there are external factors which can affect its value. As well as spotting the addition of amenities such as a supermarket, This is Money has highlighted other factors. For example, according to the organisation, the arrival of niche food chains – such as delicatessens – can be a sign that the local population is becoming more affluent and will have more disposable income. Furthermore, an increasing youth population can be positive. Afterall, the publication argues, the majority of these will be young professionals who require access to transport links and local businesses. As a result, this demand will bring these organisations to the area and improve the area – increasing house prices as a result. However, be aware that you won’t be the only one looking for these indicators. Anecdotally, there are stories of house visits turning into queues of potential buyers. As a result, these desirable properties can go for much higher than the original asking price. Therefore, it requires plenty of foresight – and a bit of luck – to benefit from these changes. How can I improve the value of my home? A loft conversion is a large investment. On average, this can cost around £11,500. However, the benefits could be huge – adding an average 12.5% to the value of a home. 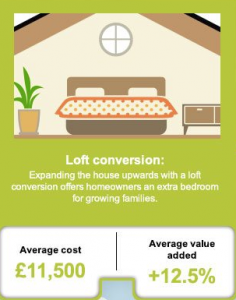 Buyers will always pay more for extra space and a loft conversion is an effective way to do this. However, in some cases, they can be difficult to implement and planning permission might also be required. Therefore, a survey should be carried out to analyse how feasible this is before taking the plunge. If it’s too difficult to head up, maybe you can head down. If you have a large basement which is being used for storage, you might be able to convert this into an attractive living space. There is a lot of work to making this a viable option though and, on average, can cost around £20,000. 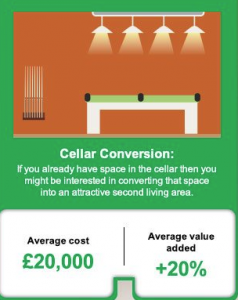 However, if successful, a cellar conversion can add an average of 20% to the value of your property. Installing a brand-new kitchen is often an expensive prospect. However, a kitchen remodel could be a cheaper alternative to increasing property values. For example, changing the cupboard doors and adding new handles can give the place a smarter finish. 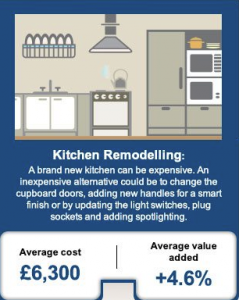 On average, the cost of a kitchen remodel can come in at around £6,300. Yet, this could add an estimated 4.6 percent to the value of your home. If you’ve got the space, then a conservatory can be an excellent way to improve the value of your property. However, it is not without challenges. Planning permission might be required and you should decide whether this extension should be east or west-facing. Which direction you choose will determine if the conservatory is better suited as a breakfast room or as an evening living area. 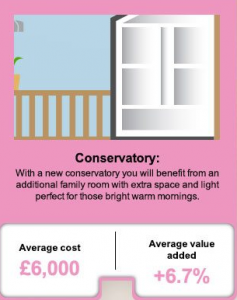 Regardless, for an average cost of £6,000, a conservatory can improve the value of a property by an average of 6.7 percent. The bathroom is perhaps the most important room in a home and remodelling it can be greatly beneficial to the overall value of a property. In fact, just keeping it clean and free of grime could be time well spent. Alternatively, remodelling the taps or installing a stylish sink can go a long way to making the bathroom a cheerier place. 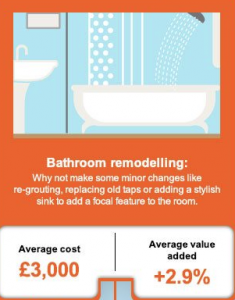 On average, remodelling the bathroom can cost around £3,000. However, this could add an average of 2.9 percent to the overall value of your property. We’ve dealt with some of the larger investments here but there are a variety of smaller jobs which can pay dividends. We’ve detailed some of these suggestions here. It’s amazing what a lick of paint can do. However, don’t limit your redecorating to the inside of your home. Sprucing up the outside and tidying up the front lawn can make your property a much more attractive prospect. Furthermore, if colours are fading, consider replacing them with a new coat of paint or wallpaper. Living areas and bedrooms should feature warm colours, hallways could benefit from neutral schemes, and bathrooms should have cool interiors. 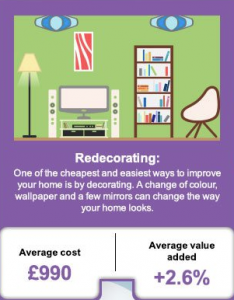 On average, redecorating a home can cost around £990. However, it can add an average of 2.6 percent to the value of your property. 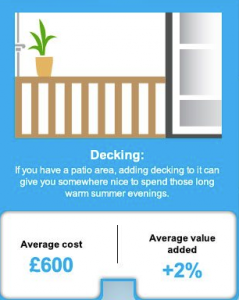 If you already have a patio area then some decking can go a long way to making it a more charming prospect. As long as you use a quality supplier and make the addition an attractive one, you could increase the value of your home as well. For an average cost of £600, we estimate that the average value of your home could increase by around two percent. Replacing carpets with wooden flooring can really make a difference when boosting property values. As long as this isn’t done excessively and uses quality supplies, strong and study wood can enhance the appeal of a room as well as benefit the bottom line. 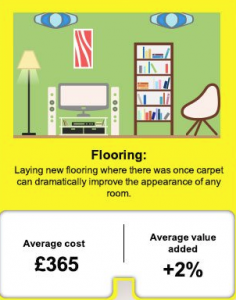 In fact, spending an average of £365 on flooring could improve the average value of your home by around two percent. How much value can my property gain? In this guide we have looked at multiple ways you can improve the value of your home. From larger jobs to quick maintenance, the changes mentioned above should go a long way to affecting your bottom line. If you carried out all of these suggestions, we estimate the price of your home could increase by an average of 53.3% at a cost of around £48,000. Therefore, looking at 2017 average house prices, this means a typical home in the north west could gain around £83,000 in value. In contrast, a standard home in the south east may see its value increase by around £171,000. By bearing these in mind when conducting home improvements, we hope you won’t experience any nasty surprises! How Much Do Double Glazing Windows Cost in 2017?